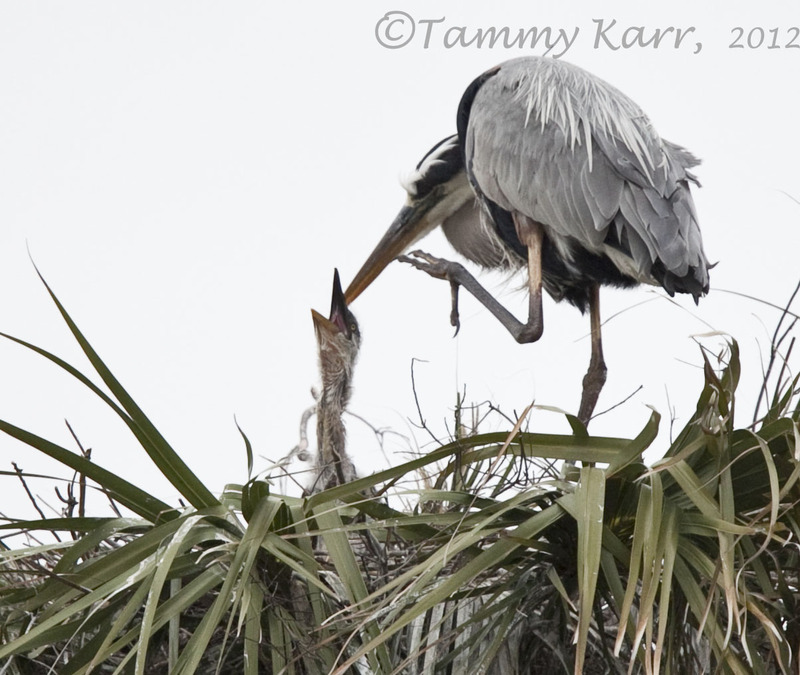 i heart florida birds: They're Here!!! I was ecstatic to see some Great Blue Heron babies yesterday!!! I visited the wetlands on Sunday's very gloomy afternoon. Three nests had babies, all which, I believe hatched in the past 4 days. Some appeared to have hatched in just the last day or so. Hopefully the sun will come back soon, so I can get some better photos! I'm guessing the chick in this nest may have hatched first as it was larger than the others. This nest appeared to have two hatchlings. 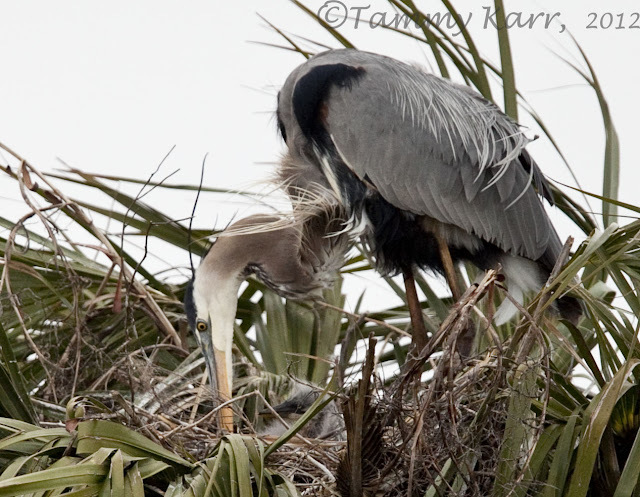 The Great Blue Heron mom seemed stunned by her new addition. I believe these hatchlings are only a day or two old. There appeared to be two in the nest. How cool that you get to follow their progress as the nestlings grow up! I'm looking forward to more great series like this one! Thanks Nicholas! I look forward to checking on them as often as possible!! Hehe these are great, musta been a great experience. Have you thought of names for them yet? I really enjoyed listening to them as they all sounded very hungry:) Hope pops brought a good meal for all! Thank you for your comments Karen! We are lucky that they build their nests each year in the palm trees close to the road. I'm glad you have a rookery close by as well. Wooohooo! 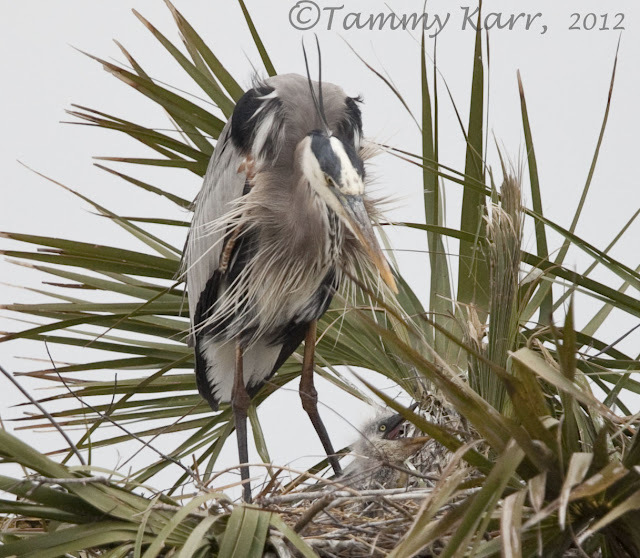 This is great news!I hope to watch them grow through your images Tammy. ¡Tu tienes algo especial con las garzas! ¡qué tiernas y bonitas fotos! amazing little ugly things! so ugly they're adorable, though! There is definitely nothing wrong with those photos! Wished I had half your talent! How cool! I bet they grow pretty quickly, too. It's great to see photos of the chicks! They do grow so fast! I hope I can get back often to see them. That was early for us norwegians, we don't see the "baby-birds" before may or june ! Hope you will follow them ? It's probably alot warmer here than Norway:) It gets really hot here by June. I will definitely follow them. It's one of my favorite things to do each year. Lovely photos. 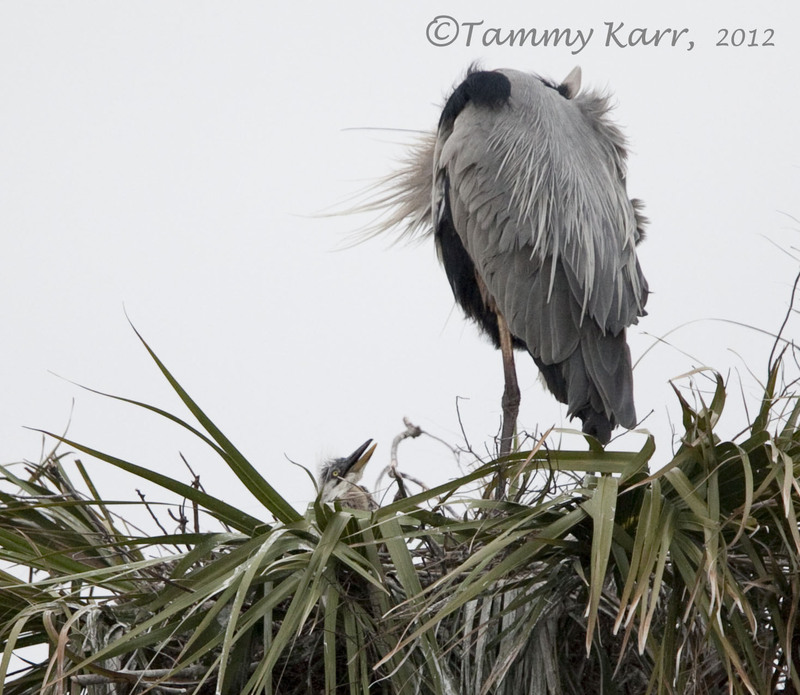 The contrast in size between the adult and baby's bills in the second photo is amazing - and quite comical! It is amazing how small their bill is, but it will grow really fast! Thanks for your comments. How super cool are they Tammy. You have captured these perfectly, and after waiting so long to see them i bet you were well excited. Thank you Shaun. Hopefully I can capture them better when the light is a little more cooperative. Muy agradable el momento captado, bellas imágenes de esas crías con su madre. Great shots, love all of them. Hope you'll show more photos of them later. Thank you for your comments, I will definitely share more! That's wonderful, two babies. Brilliant photos. Thanks Bob! It actually looks like a total of five for the three nests! I hope they will all stay safe! AWESOME! I envy you this opportunity. I'd spend every day there documenting thier progress. Wonderful! And, I love your banner shot of the eye and the way the bill is crooked. Very nice. 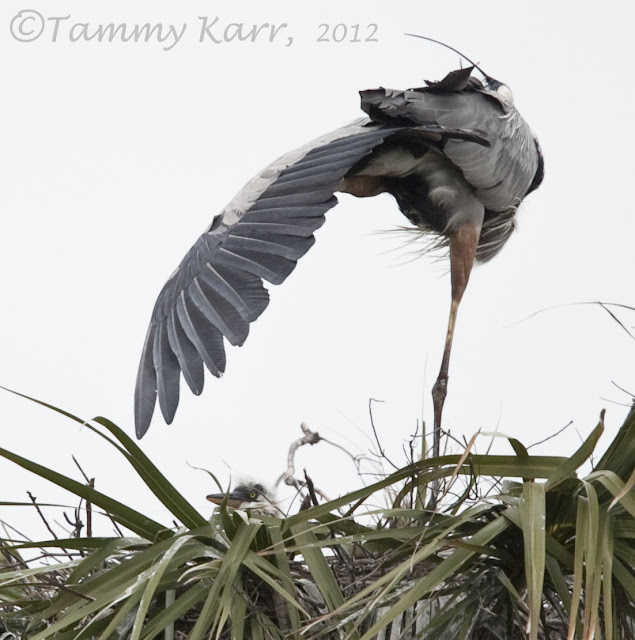 Amazing to see this heron on his nest. Funny to see that tiny little face of that young heron. Lovely!! That's great news. Love that second photograph. How cute. What a family. OH wow... never seen heron babies before, that is so freakin awesome! Thanks for sharing these guys..
Ahhh...got to get over there, Tammy! Fantastic!! !